Gifting with elegance, style and a personal touch! 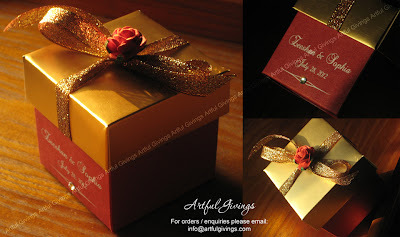 These boxes were designed specially for a red & gold themed wedding in Ct, USA. The client wanted a touch of white so we used white font and added a white rhinestone. It was then embellished with a golden ribbon and a red rose. 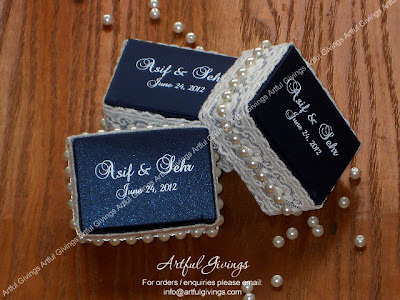 Our latest boxes were made for a wedding in Canada. 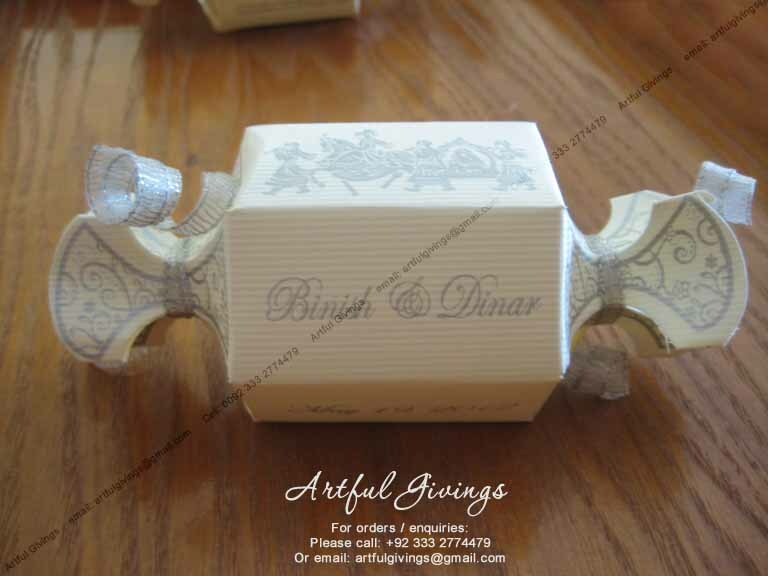 Binish wanted something different, with a desi touch. We made these elegant yet endearing candy shaped boxes for her. The motif chosen was an image of a baraat (wedding procession). Perfect for a desi wedding! Baby bootee bear themed boxes! Mr. Sultan wanted boxes to announce the birth of his baby in one day! He wanted something cute and different. 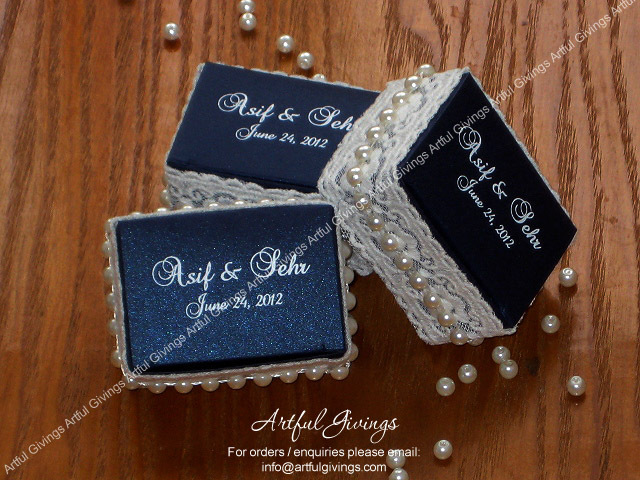 We got these striped polka dotted boxes and adorned them with ribbons and a baby bootee! Since the baby bootees had bears on them, we attached a bear card to it and completed the bear theme! So cute! Birth Announcement Platter Wrapped Up Pretty! Mrs. Adil came to me with nothing specific in mind. She wanted something cute and different to announce the birth of her first grandson. She wanted to distribute nithai (sweetmeat) so we needed something big enough to hold that. Mrs. Adil loved them so much, she took some with her all the way to the US to share her joy with friends! Aren't these adorable! Teddy bear themed birth announcement / baby shower boxes! 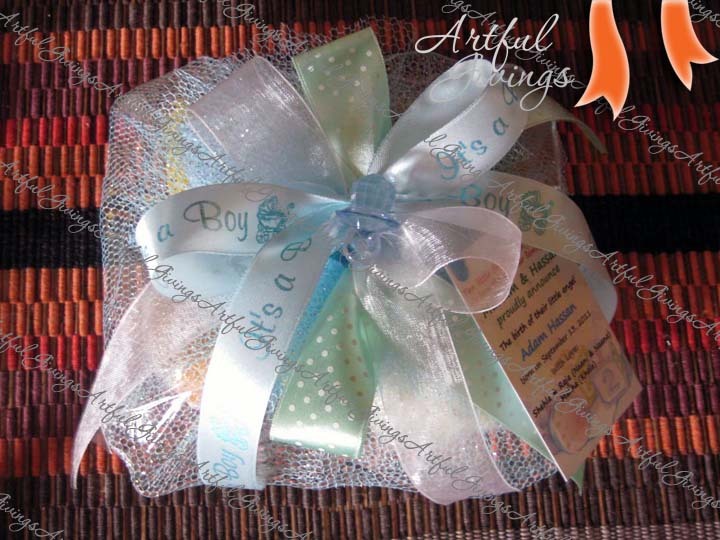 4" x 4" polka dot boxes adorned with 'It's a Boy' ribbon and a small teddy! These were filled with teddy shaped chocolates! Another one of my favorites! Mrs. Mus knew exactly what she wanted before she called us and she got exactly that & more! 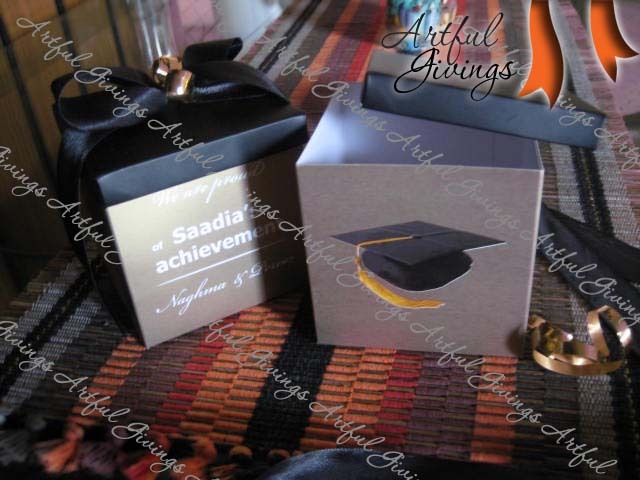 A dull gold box was designed with a graduation cap and a personalized message from the proud parents celebrating their joy! It was filled with sweet meat(mithai) and adorned with black and gold ribbon. Mrs. Mus was delighted by the appreciation the boxes received! This box was an instant hit! Mrs. Memon loved it so much, she ordered the same ones for her daughter's graduation. So I made them with a slight variation for her. I deepened the color and this time I adorned them with a ribbon and tassel in line with the graduation theme! In our part of the world, there is a tradition of distributing something sweet to announce the birth of a baby. Usually sweet meat (mithai) is chosen and distributed in boxes. Mrs. Kazi wanted to do something different. So we gave her an adorable alternative! A beautiful cane pram was made in blue. 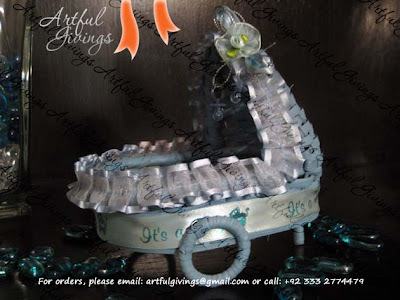 It was then embellished with frills, ribbons, a small flower and small pacifiers for that perfect finishing touch! Mrs. Kazi chose to fill it with chocolates and a personalized tag to announce the birth of her little prince. This giveaway was a huge success and it worked as a keepsake too! I made this in 2009 but it is still as endearing as ever! Giving with elegance, style and a personal touch!